In his Histories (namely in the book IV), Ephorus had to linger on the events connected to the birth of the Greek settlements in southern Italy and Sicily. His account on the matter was certainly treated with great respect. In fact, Polybius assesses (XXXIV 1,3) that Ephorus was reputed to be a highly regarded author on subjects such as foundations, migrations, kinship, archegeteses. This paper is intended as the first part of a wider work, and aims to investigate the narration of Ephorus on the Greek colonization of the West, as it can be recovered from the fragments of the Cuman historian, and from the secondary tradition, starting from the Iambs to Nicomedes (i.e. the Perigesis of the so called Pseudo-Scymnus). As it emerges from the words of their author, as well as from the account as a whole and from the details, the secondary tradition follows in the footsteps of Ephorus, when describing the stories of the western apoikiai. Herodotus’ account of the battle of Marathon, when compared to the far much richer and consistent narration of the events belonging to the second Persian Wars, is mostly considered as scarce and imprecise. The relationship between Herodotus and the Athenian tradition concerning Marathon is therefore described in terms of discontinuity: due to several reasons, the historian was not able, or did not want, to recount more in detail the fight at Marathon. In light of a renewed analysis of the Athenian memorials dating to the ’70-’60s (IG I3 503/4, SEG LVI 430 and the Painted Stoa), this study highlights an important aspect of continuity between Herodotus and the Athenian post-war tradition: in contrast with what happened in 480/79, in 490 the battle was fought outside the city gates, and Athens was prevented from burning. Since their birth, in the last decades of Vth Century, the words demagogue and demagoguery built a coherent and negative picture of the leading politicians of Athens during the Peloponnesian war, but from different points of view: against the portrait made by Aristophanes of the demagogues as uneducated, corrupted speakers mainly involved in the internal struggle, Thucydides underscores their use of a violent rhetoric to support an aggressive foreign policy. The aim of this article is to investigate how these different ideas about demagogy developed through the Vth and the IVth Centuries in the political, historical and philosophical debate, and produced the theoretical concept of demagogue as a bad politician who is leaded by the people. The large amount of details of Thucydides’ presentation of the Pylos campaign has often raised the question of whether the Athenian historian was an eyewitness of the facts he relates. Nevertheless, because of a serious topographical mistake, it is widely believed that Thucydides did not take part in the campaign. By focusing on some details of chapter IV 4, this paper aims to offer a different view. On the one hand, the comparison between Thucydides’ description of the Themistoklean walls (I 93) and the building of the Pylos fortification strongly suggests Thucydides’ presence at Pylos. On the other hand, the unusual reference in the same chapter to the military office of the taxiarchs, also makes it likely that in 425/4 – the year before his strategia – Thucydides was taxiarch. Some of the economic features described in the Greek economical literature of IV century b.C. existed already in the V century, before their conceptualization by thinkers like Xenophon, Plato and Aristotle. One of the most outstanding figures in the Attic economy of the V century was Nicias, the famous politician also known for his extraordinary wealth. Through the analysis of his political and economic activities it is possible to evaluate the relations between economy and politics and the stage of development of Attic economy in the classical age and to observe practical aspects of economic life that contributed to shape the economical thought in the following century. The puzzle of Demosthenes’ khoris oikountes ‘living apart’ Athenian navy inductees and their possible relationship to apeleutheroi (slaves? freedmen?) has been revisited in a number of recent articles. This long-debated theme has implications for whether privileged slaves—those granted lifestyle autonomy—constituted a distinct and significant category among slaves in classical Athens. Most recently, Canevaro and Lewis have argued that apeleutheroi were freedmen divided into two sub-groups: one sub-group ‘lived apart’ from their former owners and the other “lived with” them. The present article concludes that C&L are mistaken: the technical term apeleutheros refers only to privileged slaves who lived apart from owners and who should be identified with Demosthenes’ ‘living apart’. More generally, the discussion contributes new understanding of the nature of Greek slavery, including of the long-debated paramone-clause in slave sale contracts and of the roles of pais, therapon and ‘Plataean’. The article deals with the overall topic of the trade between the Mediterranean World and the Indian Ocean. Object of the analysis are two important toll-gates in the Red Sea, the ports of Jotabe and Leuke Kome (both in the Arabian Peninsula). The approach of this work is based on the assumption that the study of some features of the early Byzantine administration of the area can shed some light on some still obscure aspects of the Roman organization of the same area. The comparative analysis of the evidence provided by the Greek-speaking sources from different periods, in fact, show interesting similarities between the two different periods. 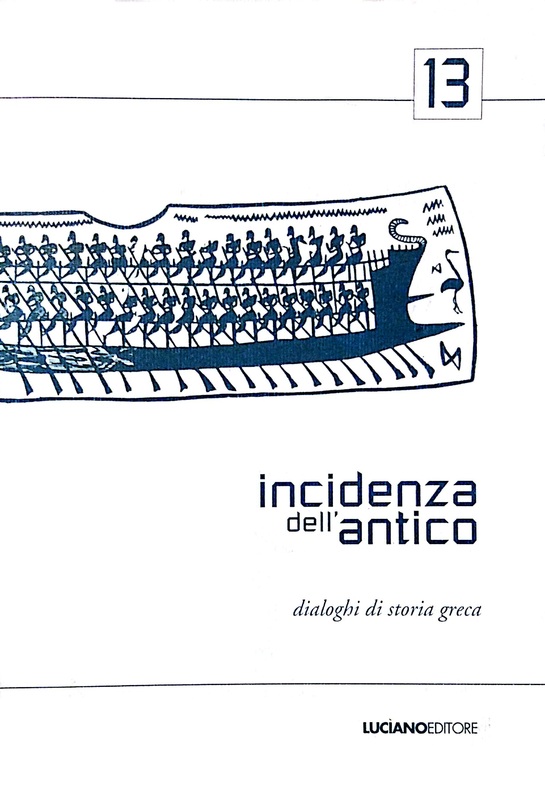 Eforo di Cuma nella storia della storiografia greca (Atti dell’Incontro Internazionale di Studi. Fisciano-Salerno, 10-12 dicembre 2008), a cura di P. de Fidio e C. Talamo, con la collaborazione di L. Vecchio. Macchiaroli (PP 68-69, 2013-2014), I-II, Napoli 2013-2014, pp. 989. ISSN 0031-2355. Donum Mycenologicum. Mycenaean Studies in Honour of Francisco Aura Jorro, edited by A. Bernabé, E.R. Lujàn. Peeters (Bibliothèque des Cahiers de l’Institut de Linguistique de Louvain, 131), Louvain 2014, pp. 276. ISBN 978-90-429-2909-8. Federica Fontana, Tra autonomia e dinamiche regionali. Storia di Fliunte dall’VIII al IV secolo a.C. Edipuglia Editore, Bari 2014, pp. 352. ISBN 978- 88-7228-731-6. Léopold Migeotte, Les finances des cités grecques aux périodes classique et hellénistique.Les Belles Lettres (Epigraphica, 8), Paris 2014, pp. 770. ISBN 978-2-251-44491-8. Carmine Pisano, Hermes, lo scettro, l’ariete. Configurazioni mitiche della regalità nella Grecia antica. M. D’Auria Editore, Napoli 2014, pp. 303. 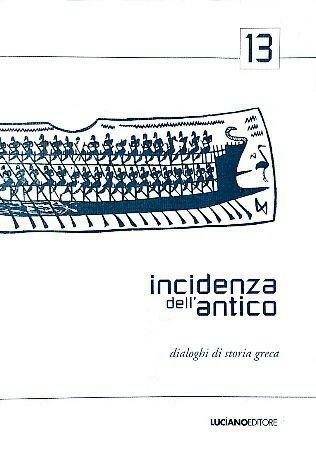 ISBN 9788870923629..
Damiana Baldassarra, Dal Saronico all’Adriatico: iscrizioni greche su ceramica del Museo Archeologico Nazionale di Adria. Edizioni ETS (Diabaseis, 4), Pisa 2013, pp. XV-366. ISBN 978-884673809-7..